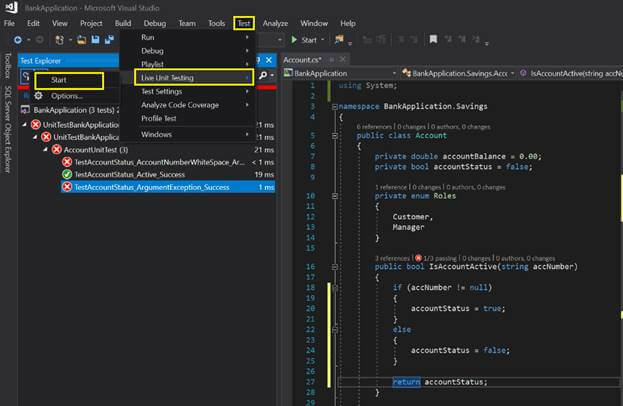 Live Unit Testing is a brand-new technology, made available in Visual Studio 2017 version 15.3 or above. Live unit testing enables the IDE to execute unit tests automatically in real time without cod being build, and as you make changes to the code. 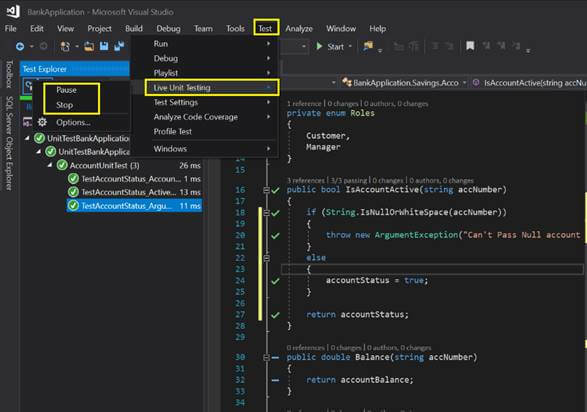 Live Unit Testing is a brand-new technology, made available in Visual Studio 2017 version 15.3 or above. 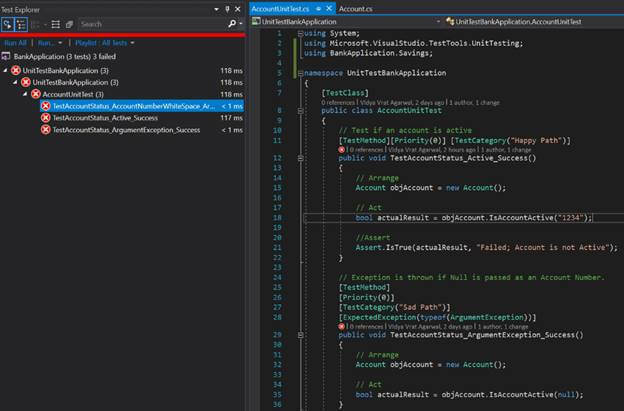 Live Unit Testing enables the IDE to execute unit tests automatically in real time without code being built, and as you make changes to the code. Unit Tests and code have a very close relationship, and both depend heavily on each other; i.e. a change in source code must impact the unit test(s) code for what was being tested. Similarly, a change in a unit test must impact the code coverage of the source code, which is being exercised via unit tests. In the light of the above-mentioned problem statement, there is no efficient and developer friendly solution which a traditional unit test can solve. Moreover, validating code changes through unit tests may quickly turn out to be a tedious task, as you must run all the unit tests from Test Explore after every code change. It empowers the developers to refactor and change their code with greater confidence. Live Unit Testing graphically depicts code coverage in real time and provides a quick visual view of the code coverage, and which code statements are passing in unit tests. As per the name “Live Unit Test”, you don’t have to build the code and run the tests again via Test Explorer to validate the changes. I.e. soon after code changes are made, unit tests will be automatically executed to reflect the impact (pass, fail). This code is showcasing Test Driven Development, i.e. write a failing test, and then write code to make that test pass, and so on. Now, if you will run the tests again, by clicking the “Run All” option in the Test Explorer, then you shall observe that of the1/3 test cases pass, as shown in the image below. Unit Test code or source code which is being tested doesn’t explicitly tell which code lines are being covered, not covered, or passed via unit tests; i.e. whenever the developer changes the code, test cases need to be run over and over to identify the impact, and that is without any visual clue in the code files. Hence, with traditional unit testing, a developer can’t clearly tell which code statements are covered, or not covered, through passed or failing unit tests. 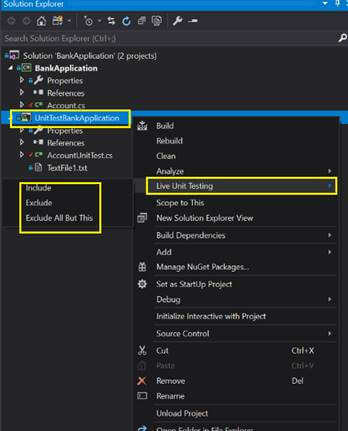 If you don’t see this option then you might not have the appropriate version of Visual Studio 2017 Enterprise Edition, which offers the Live Unit Testing feature. However, if you have Visual Studio 2017 enterprise edition, and you don’t see this option, then you can add the Live Unit Testing tool from the setup menu, and select it from the Individual components tab. 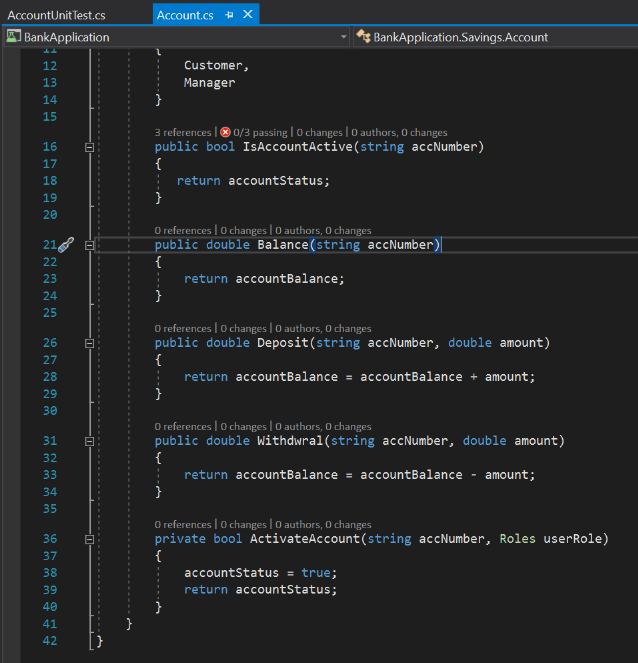 and put it in Account.cs class’s IsAccountActive() function, and soon after putting the code in there, without building the code explicitly, you shall observe the changes, and notice that now, two tests are passing. Alongside, you shall observe the changes to the code line symbols X, ─, and √ on the left. 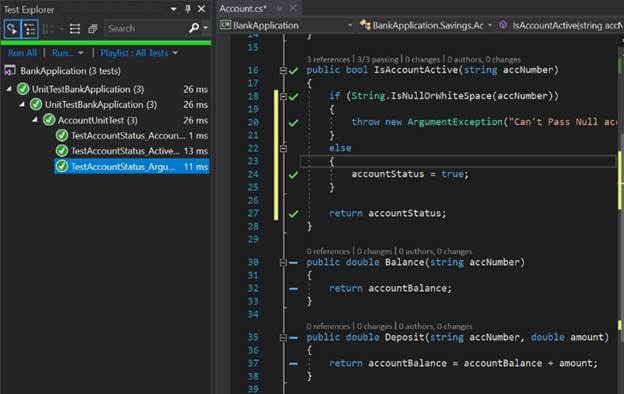 As soon as the code is refactored, again without any explicit build and running tests from Test Explorer, Live Unit Testing observed the code changes and ran the tests. As shown in the image below, now all three unit tests are passing, and all code lines in Account.cs class’s IsAccountActive() shows √ symbol on their left. √ symbol means that all code statements in this function or block are covered by the Unit Tests. As you can see in the image above towards the bottom-half, ─ symbol in front of other code blocks, which means that these code blocks are covered by 0 tests; i.e. no unit test case(s) exist for these code blocks. You may want to take it to the next level by taking code from my GitHub repo and expanding it. Live Unit Testing appears to be a milestone in fast-paced, technology-heavy software development field. This certainly doesn’t take away the importance of knowing Unit Test fundamentals, rather, it enforces the TDD (Test Driven Development) mindset in an effective, and productive manner to the developer community, by showing visual clues in the IDE code window, and running the tests while the developer is refactoring the code.